I wonder if our politicians have begun to wonder just how Obama did it. What it was that made all those people get out and vote? Yesterday I was interviewed by the BBC World Service Radio on this very subject - as obviously I'm the very first person to ask on such weighty issues what with being the editor of a dog magazine and all that! And, of course, I was able to point them in the right direction. Yes, he is the first black President, true. But people are still missing the obvious. Obama unleashed the dog vote. That's why he had the extra big turn out. Dog folk in the States were fiendishly well organised. Months ago I was sent a dog collar for Tess to wear which said 'Vote Obama'. A year ago, dog bloggers (and even the cat bloggers - this really was a new dawn of love and unity) linked together to get their main man elected. What a force they were! Click here - they have some really cool merchandise! And what an acceptance speech from Obama, a classic, promising his daughters a puppy... masterful! He gave us all exactly what we had been waiting for. But if he thought the election was tough, the debate as to which dog he should get has filled the political papers big time with passions raised on all sides. Forget the economy, national security etc. This is the issue that will shape his entire Presidency. PETA were saying - no way to a pedigree. Oprah Winfrey shocked the nation with a special on shelter dogs. The American KC rushed to provide a poll and Poodles narrowly beat the Soft Coated Wheaten Terrier as the new pedigree dog of choice. The Times newspaper unkindly dealt the Poodle a blow by pointing out the negative history of past Poodles and Presidents - Ronald Reagan having had a quite feisty one called Margaret Thatcher and of course Bush always having his faithful Tony Blair . He wants a shelter dog, and as he says it'll probably me "a mutt just like me." The cheeky old BBC World service made me stray into lots of other politically incorrect areas, too. Why, they asked, is the Pope a cat lover? I helpfully pointed it out that perhaps he just hasn't met the right dog yet. That having a cat was more like having an affair and it would be a lot more appropriate for the Pope to be in a happy marriage - having a more grown up relationship with a good dog. Will we see Brown and Cameron rushing to get involved in capturing the dog vote, too? What sorts of dogs should they get... hold on - I'm not going to help either of them unless they agree to putting helpful legislation together that starts sorting out the pedigree dog health problems. I'm standing firm on this one. Who'd have thought as the editor of a dog magazine the job could be quite this broad! It's even in the Sunday Times today - click here. Will the story ever slow down? The Pope loves cats because he is a CAT-a-lick! Boom boom. sorry. I love this game. Choosing a dog for the president. The most ethical choice would be a staffie cross rescue. But I do think that a more glamorous English Setter would look lovely on the lawns of the White House. Preferably one with an incredibly low COI and one from health tested lines - so securing that pup might be a difficult task. 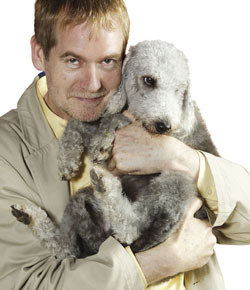 But if those girls want a schnoodle that's ok by me. And apparently they should not find it too difficult because I am frequently told by people on the "other" forums that those shelters are awash with those designer dogs. Hope they will all be happy with their new pup. I think obama should choose a pit bull as his new pet ! give the breed a better name, its only the idiots that fight them that have given this lovely breed a bad name, so stand up for the dogs!! i love pit bulls. If you watch the dog whisperer, he has lots of Bit Bulls, and they are all so well behaved, it goes to show that it is the morons who own the PB,s that are dangerous, not the breed itself, I think its just what the whitehouse needs, a PB! !